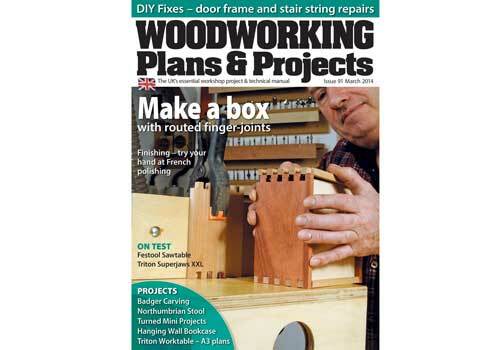 In the March issue of Woodworking Plans & Projects we have a great selection of projects, techniques, and features for you, as well as our kit & tools section and our regulars, including 'From the Editor', 'Noticeboard' and a peek at the next issue. Our 'Projects' section has a wide variety of articles for you to make, such as Mark Baker's project on five platters for you to make; Walter Hall shows you how to make rustic stools and Wendy Greenwood constructs a wall-mounted bookcase. On the technical side, we take a look at French polishing, and in DIY fixes, we focus on door frame and stair string repairs. In terms of features, you will find the usual Tools of Yesteryear, where Anthony Bailey looks at the Stanley chamfer plane as well as reviewing a range of woodworking books. In 'The Woodland Way', woodsman Ben Law shares an extract of his book, which explains his sustainable approach to woodland management. In our Kits & tools section, we have Craftsman's Corner, Hot Stuff, which looks at the latest tools and gadgets that we think you'll enjoy, and finally a review of the SuperJaws XXL. If you'd like to save up to 42% by downloading the digital version of the magazine for your iPad, iPhone or Android device, just click here.